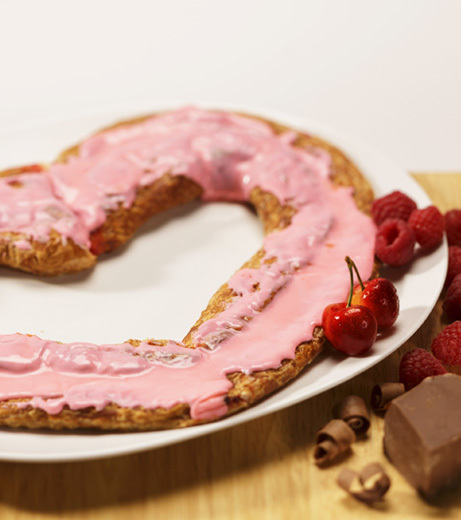 Give something sweet for Sweetest Day! 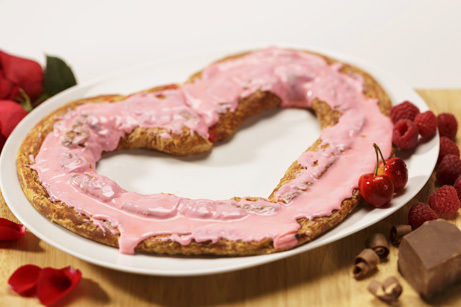 Our Heart-Shaped Kringle (14oz.) 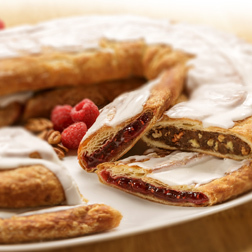 available in the following flavors with sweet pink icing–Cherry, Pecan, Raspberry, and Chocolate Silk. Sweetest Day is Saturday, October 20th, 2018 – Don't Forget! Wheat Flour, Margarine (Interesterified Soybean Oil, Water, Salt, Mono- and Diglycerides, Colored with Annatto/Turmeric. Calcium Disodium EDTA preservative. Artificial Butter Flavor. Vitamin A Palmitate added. ), Sugar, Corn Syrup, Brown Sugar (Sugar, Molasses, Cane Syrup), Raspberries, Eggs, Modified Food Starch, Contains 2% Or Less of the following: Soy Protein, Soy Lecithin, Yeast, Dextrose, Salt, Citric Acid, Soy Flour, Canola Oil, Red 40, Natural & Artificial Flavors(Milk), Potassium Sorbate Preservative, Sodium Benzoate Preservative, Sodium Citrate, Tocopherols Preservative, Guar Gum, Beta Carotene, Titanium Dioxide, Calcium Carbonate, Palm Oil, Maltodextrin, Agar-Agar, Calcium Propionate, Corn Starch, Cinnamon, Malted Barley, Caramel Color, Annatto Color, Oleoresin of Paprika, High Fructose Corn Syrup, Glycerine, Red 3, Yellow 5, Carrageenan Gum, Xanthan Gum. Sugar, Wheat Flour, Margarine (Interesterified Soybean Oil, Water, Salt, Mono- and Diglycerides, Colored with Annatto/Turmeric. Calcium Disodium EDTA added as a preservative. Artificial Butter Flavor. Vitamin A Palmitate added. ), High Fructose Corn Syrup, Brown Sugar (Sugar, Cane Syrups), Eggs, 2% or Less of the Following: Dutch Cocoa, Modified Food Starch, Corn Syrup, Xanthum Gum, Guar Gum, Citric Acid, Soy Flour, Canola Oil, Sodium Benzoate Preservative, Potassium Sorbate Preservative, Yeast, Soy Protein, Soy Lecithin, Dextrose, Palm Oil, Calcium Carbonate, Natural & Artificial Flavors, Maltodextrin, Agar-Agar, Calcium Propionate Preservative, Tocopherols Preservative, Malted Barley Flour, Cinnamon, Glycerine, Red 3, Yellow 5, Carageenan Gum, Corn Starch, Color Added. Wheat Flour, Margarine (Interesterified Soybean Oil, Water, Salt, Monoand Diglycerides, Colored with Annatto/Turmeric. Calcium Disodium EDTA added as a preservative. Artificial Butter Flavor. Vitamin A Palmitate added. ), Corn Syrup, Sugar, Cherries, Brown Sugar (Sugar, Molasses, Cane Syrup), Eggs, Modified Food Starch, Contains 2% Or Less of the following: Soy Protein, Soy Lecithin, Yeast, Dextrose, Citric Acid, Soy Flour, Canola Oil, Red 40, Guar Gum, Natural & Artificial Flavors, Potassium Sorbate Preservative, Sodium Benzoate Preservative, Sodium Citrate, Tocopherols Preservative, Calcium Carbonate, Palm Oil, Maltodextrin, Agar-Agar, Calcium Propionate, Corn Starch, Cinnamon, Malted Barley, High Fructose Corn Syrup, Glycerine, Red 3, Yellow 5, Carrageenan Gum, Xanthan Gum, Color Added. Wheat flour, margarine (interesterified soybean oil, water, salt, mono- and diglycerides, colored with annatto/turmeric. Calcium disodium edta added as a preservative. Artificial butter flavor. Vitamin a palmitate added. ), brown sugar (sugar, molasses, cane syrup), sugar, pecans, 2% or less of the following: water, corn syrup, eggs, yeast, soy lecithin, soy protein, salt, dextrose, calcium carbonate, maltodextrin, cinnamon, agar-agar, tocopherols preservative, calcium propionate, titanium dioxide, natural & artificial flavors (milk), malted barley, corn starch, caramel color, annato color.